Headlines: Well the season finished in the rivers with somthing of a whimper. There were a few good fish caught in the lead up to the weekend but numbers of fish caught overall were down. Some rain and snow this week will stir a few fish up in the lakes for the coming weekend. 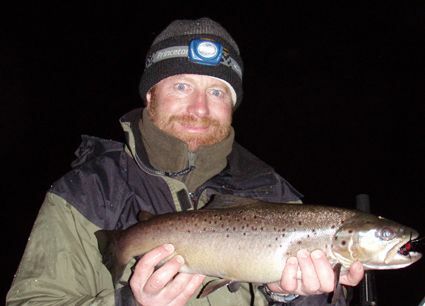 Athough you can't fish them now we did have a few good reports from the Thredbo last week. bringing two to the bank. can see from the happy snaps. *Stuart Sturgeon with a very nice 2kg brown taken in the lake on the weekend. One of two good fish landed. His mate fishing alongside him failed to get a hit and ended up getting nothing more than a cold. Eucumbene:- Trolling reports have been very quiet. Jindabyne:- Jindabyne has been good with some nice fish taken trolling around the outside of the weed beds in many of the bays. Big nine and eleven cm trout pattern Rapalas would do well on the big browns as will the larger Alex tango lures. Getting these down a bit is the key to the big browns. Rainbows will still take these larger lures at times but smaller minnows and tassies will work a little better.